The lively city of Geneva, Switzerland sits at the mouth of the Rhône River, at the southern-most tip of Lake Geneva. Geneva is a bustling city that is a European financial center. It is also the epicenter of world diplomacy and serves as the headquarters for many diplomatic organizations and offices. Notably, Geneva falls in the Romandy section of Switzerland. Romandy is the section of Switzerland with French heritage. As such, everything from the language to religion to cuisine has a strong French influence. 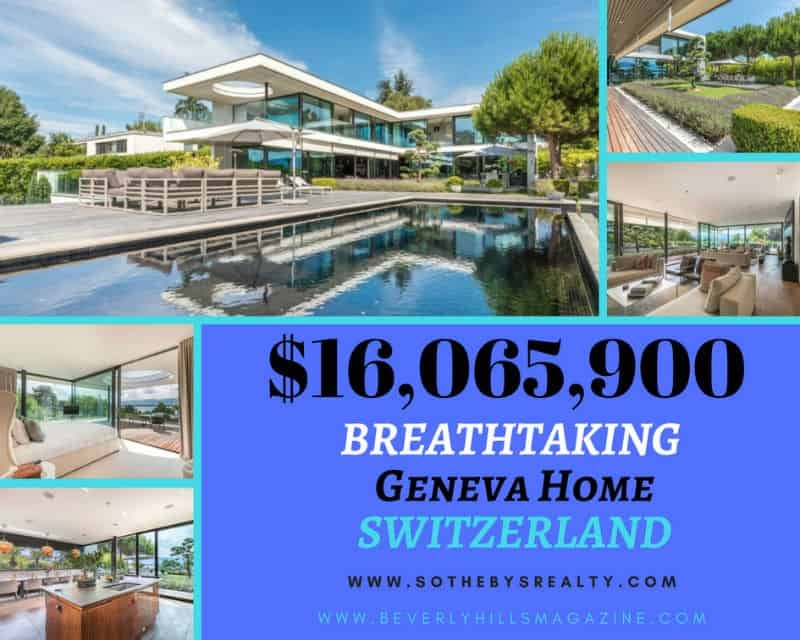 Anières, a prestigious municipality of the city, is on the Rive Gauche, or Left Bank, of Lake Geneva and just minutes to Geneva’s city center. This affluent area is home to the most expensive real estate in the city. 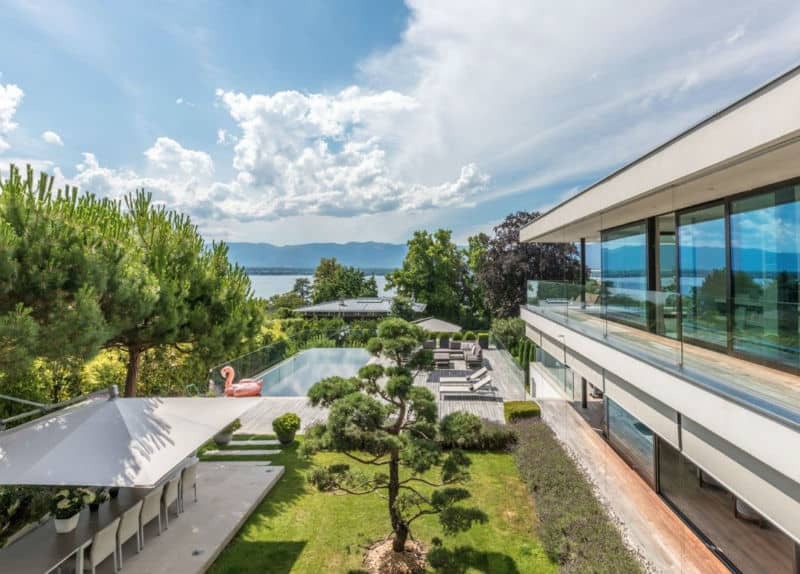 With the backdrop of Lake Geneva and Jura Mountains, this home beckons to potential owners. Built in 2011, the 5920 square foot dwelling sits on nearly one half acre. The spacious villa has 7 bedrooms, 9 full baths, and 1 partial bath. 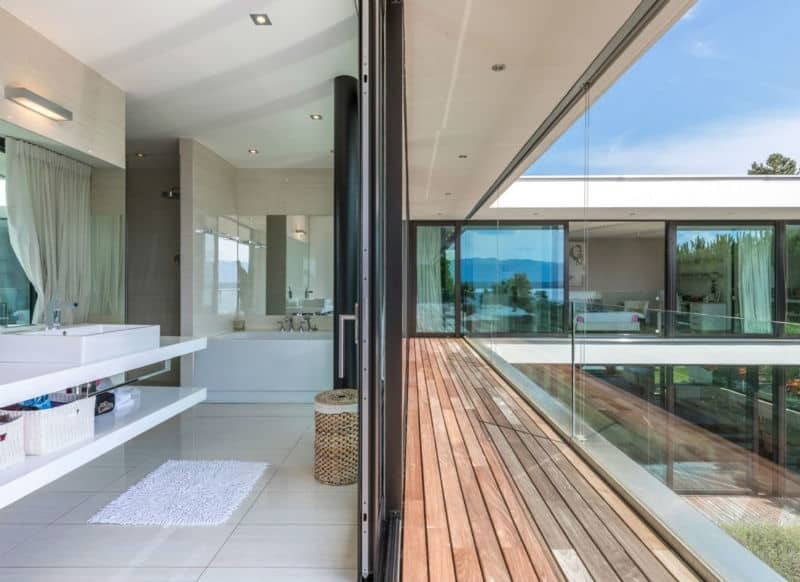 Surely everyone wakes to an amazing view in this impressive dream home. Most rooms boast stunning floor to ceiling walls of windows that seamlessly invite the outdoors in. Wide plank wooden floors continue the theme. However, this home also has many modern fixtures that, while mimicking the contemporary design style, enhance the natural beauty aesthetic. This dream home has myriad unique displays of artistry and craftsmanship. In fact, the entry of the home is one such brilliant spot. The spiral staircase, which is wrapped within a metal railing that depicts birds in flight, greets all entrants. This breathtaking, yet functional art piece, is an homage to the beautiful aquatic birds that grace Lake Geneva, such as swans, ducks, and storks. The staircase then sweeps the eye upward toward the second level where the railing continues. 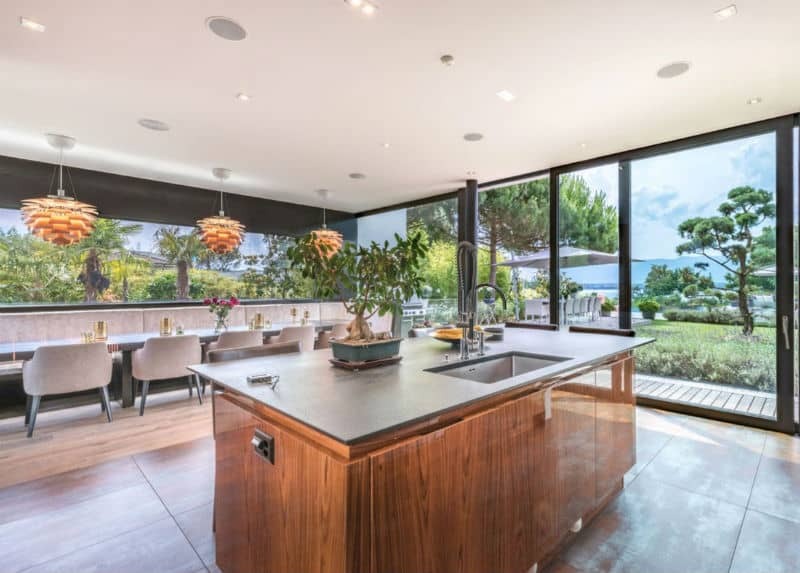 The focal point of this modern kitchen is the spacious island with a built-in breakfast bar. Coupled with the gleaming wooden cabinets, the high end appliances create the perfect kitchen for cooking enthusiasts and foodies. 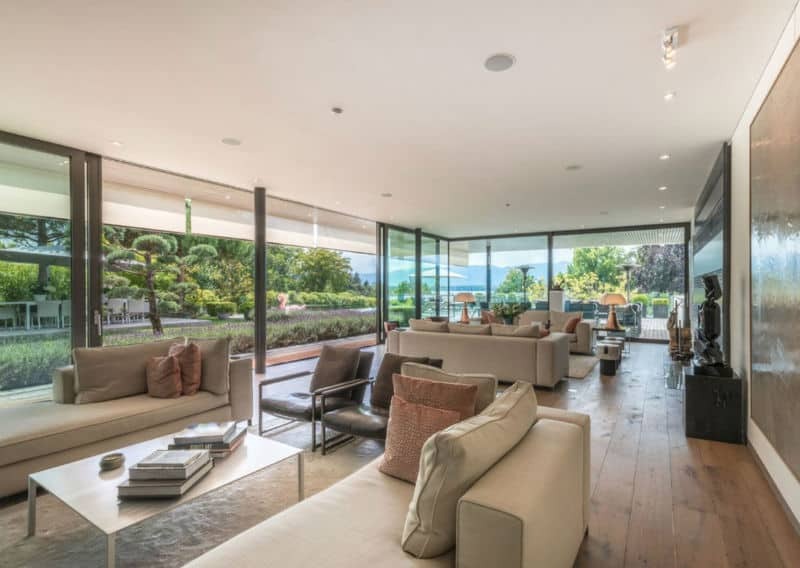 Also equipped with walls of windows, this open space adjoins the dining room. A custom banquet provides additional seating. The lowest level of the home has a beautiful indoor pool. Also, the builder reserved space for the future construction of a spa or hammam. This level also has an office, game room/lounge, and studio space. This small apartment has its own kitchenette and bath. Indeed, it would be the perfect living quarters for a housekeeper or au pair. The grounds of this home are the result of skilled design and great care. The wooden decking that surrounds the villa and meanders through the yard complements the mature trees that are found on the parcel. In addition, a separate patio sits in a slightly shaded area with space enough for a dining table and 12 guests. But the pièce de résistance of the grounds is the gleaming outdoor pool. 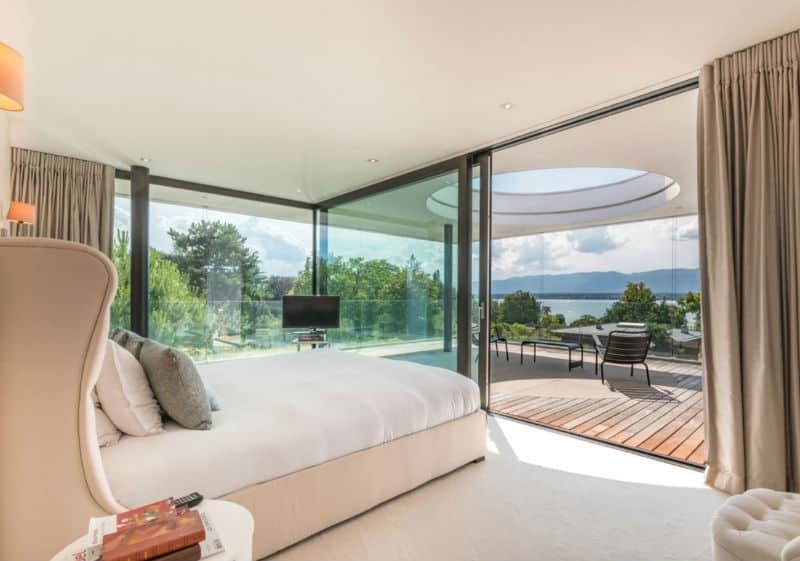 Seated at the edge of the property, the infinity mirror pool is gated by glass, providing security without impeding the glorious view of Lake Geneva and the Jura Mountains. 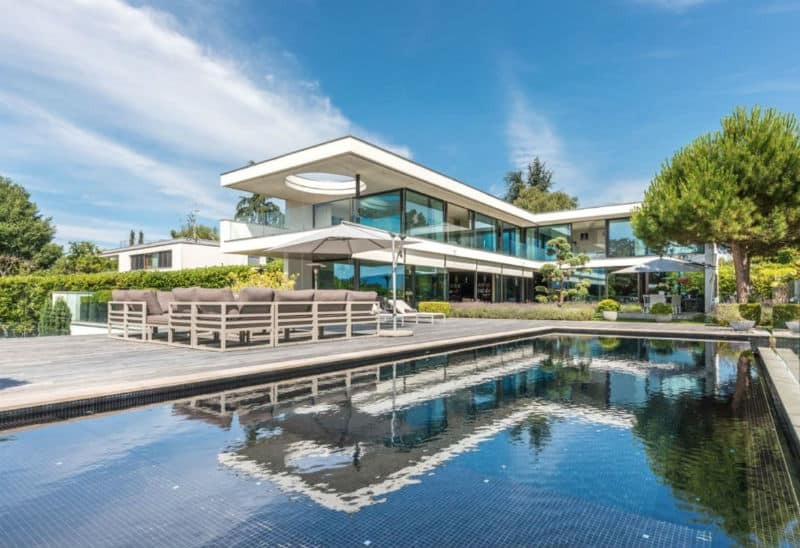 This magnificent dream home boasts unparalleled attributes in the Anières real estate market. Surely, it would be an outstanding home for personal use or a valuable addition to any real estate portfolio. 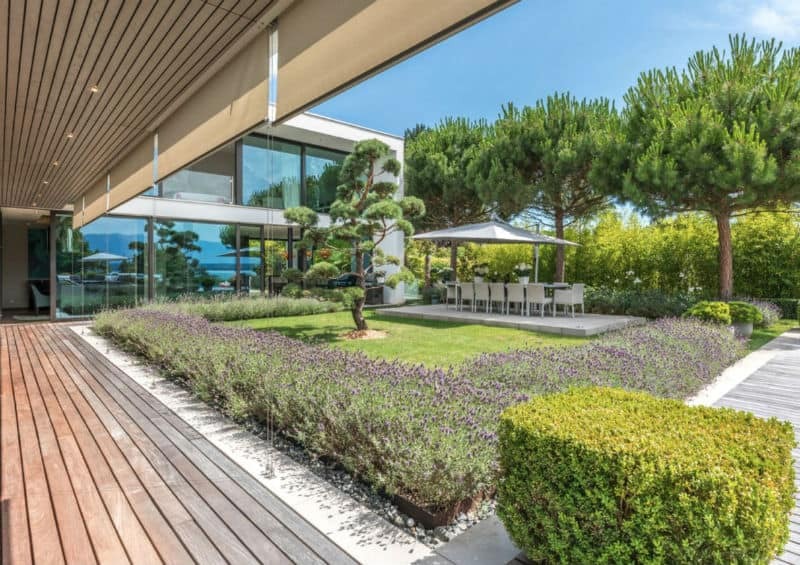 Cardis Immobilier Sotheby’s International Realty lists this villa with an asking price of $16,065,900.